Nature’s Harvest Adult Original Lamb & Brown Rice is crafted without the use of artificial flavours, colours or preservatives and with the addition of glucosamine & chondroitin to support correct joint function. Natural rubbed herbs and vitamin C are added for their antioxidant properties as well yeast extract that aids in supporting the immune system. Salmon oil is used to enhance omega 3 and 6 fats for maintenance of healthy skin and coats. 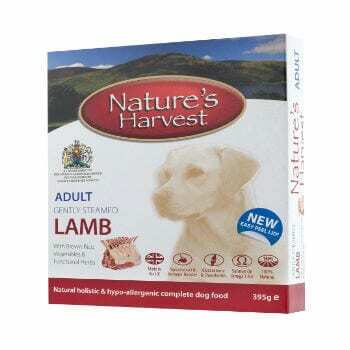 Nature’s Harvest Lamb & Brown Rice is a complete food available in single trays of 395g or packs of 10*. Lamb 60%, Brown Rice 5%, Peas 2%, Carrots 2%, Seaweed, Herbs, Glucosamine, Chondroitin, Yucca Extract, Cranberry Extract, Yeast Extract, Salmon Oil, Vitamins, Minerals. Protein 10%, Fat content 6%, Crude fibres 0.3%, Crude Ash 3%, Moisture 72.5%. Begin with the recommendations provided below and adjust to maintain body weight. Your dog’s needs may differ from the guide below due to age, breed & activity level. Always feed to maintain a lean active condition. Provide your dog with a clean container of fresh water daily. If your dog has not eaten Nature’s Harvest Adult Original Lamb & Brown Rice before, it is best to introduce it slowly over a couple of days. Feed as a complete meal or with Nature’s Harvest Wheat Gluten Free Mixer. Always consult your vet with any health questions.